We’ve gotten so many swaddles by so many brands but we end up only using these from Aden + Anais... they’re so soft and the patterns are so cute. These swaddled wraps are so sweet! Well made and nice and light for my Florida grandson!!!! I love the size and feel of these blankets and so does my son, he is now one year old and these are still his favorite! The Aden + Anais blankets and swaddles are always a hit. Really think the mom-to-be will be happy with this set. Can't wait to use these soft blankets when my bevy arrives in November. The print is precious!! Fast shipping and a great price from Albee. Will order again. The cotton muslim swaddles wash much better than the bamboo versions so I'm glad I got these as well. They also provide a tighter swaddle than the bamboo material so that's another plus. Overall, I'm glad I got these and they've doubled well as a nursing cover / blanket for my baby. I bought these not to use as swaddles, but as a light weight blanket to protect my son from the sun when he naps in his stroller on vacation. Very nice material. Lightweight. Wish I had these when he was an infant. Great quality, very soft and big enough for multiple uses. Since our little guy is due in July I have been obsessed with Aden + Anais because the weight is perfect for summer. He hasn't arrived yet, but these are adorable for a little boy and they are soft and light weight for swaddling or a light stroller blanket. Can't wait to use them. These blankets are amazing! The are so soft, and light, and breathable. I love the large size for easy swaddling. The prints are adorable. We own quite a few Aden + Anais products and have never been disappointed. Absolutely love these Swaddler blankets! From working in a childrens hospital the importance of being able to swaddle an infant is incredible. These swaddlers give you so much room to bundle them up nicely! I will definitely be ordering more. These blankets are soft, breathable and the bold beautiful colors do not fade with washing. I would recommend to anyone. The one that appears red is actually a raspberry color.....still red enough for a boy. ProsColor does not fade. They are large. Very pretty for girl or boy. Best UsesIn crib or for use anywhere. I use these swaddles for everything and my baby boy loves how they feel. These were worth paying a little extra and I love this particular design because it's unisex! I'm a first time mother and after 3 days home with my son I realized these were a lifesaver!! I didn't know how to swaddle my son using other blankets but these were the easiest. Cleaning was a breeze. I had issues with changing his diaper and we soiled many blankets during our first few days home. I found that stains immediately rinses of the Aden + Anais blankets. At $10 a piece these blankets are worth every penny. I just wish they weren't made in China. I love the colors, even after over 20 washes the wrap did not lose pigmentation. Finally awesome colors meet quality of aden+anais . These are the best swaddling blankets and such a nice light material for newborns. My baby was born in the hot months so this was perfect to keep him well-swaddled but not overheated. I love the hot air balloon blanket the most but a very cute all-around pattern. This blanket is the perfect size for newborns! They are not the original Aden and Anais swaddles, they are slightly smaller, which is perfect for little guys. You can wrap them up nice and tight, and that's what I bought them for. I am that mom that followed all recommendations, no bumper in the crib, no blanket till after 1. So when he was ready to keep his "blankie" in bed I was happy knowing he was using a breathable blanket. ProsComes in 4 pack so don't have to worry about not having one clean! These are the best blankets ever. They are really multipurpose as the packaging says and it's perfect for any weather. ItGreat prints too. Super soft after washing. The blankets are unbelievably vibrant. They just aren't as soft as other Aden + Anais swaddles. I've found the more color or pattern a blanket has, the rougher it feels. very happy with quality of merchandise. Size works great for baby. Great product at the BEST price! 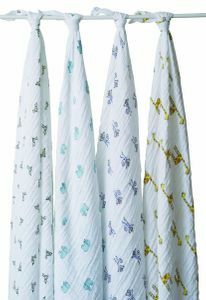 I love these swaddle blankets, and the price is exceptional! At first i was hesitant to buy these for myself due to the price, but then i got them as a gift, and have been giving them to others since. the wraps are cute, soft, and great for all weather- they can go under heaver blankets to keep the kids comfortable. my kids are 3yrs old, and they still use them, and love them. absolutely love a+a swaddles. we received the smaller four pack from our registry, and then ordered this one from albeebaby as baby got older. wish we had these instead from the start. most versatile item used daily! we trust the brand and their products. will need to wash a few times to get the fuzzies out, but washing more does make them more softer anyways, so do wash away. These wraps are wonderful during the summer when your baby needs a light wrap in the air conditioning. During the winter, you can use them to cover quilts on the floor to let the baby play on. So soft and easy to wash. These are very nice. They are well made and best of all, puts our little guy right to sleep! Aden & Anais make great products. Very happy with purchase. As always, Albee baby sent it right out after ordering. Best UsesSwaddling a new baby. Absolutely love how fast these came and they are my favorite baby blankets. Best blankets for a new baby!! I absolutely love these blankets!! They are big and light material makes these the perfect swaddle blankets. I love the bright colors. It's more than a blanket. I don't worry about letting my kids sleep with them because they are breathable. I also use them to protect from the sun, swaddle and a last minute nursing cover. This is my number one gift for baby showers. I love these blankets and so does my two year old. Have been using them since birth. Although the first ones were a gift purchased from target. They do not make the same ones for target or babies r us. They are thinner, not as soft and the measurements are smaller. My daughter wore the edges off to the point of holes, so I bought these original ones on this site. These are thicker so they will last longer. Best Blankets for Babies & Kids EVER! Aden & Anais blankets are great. These ones were cute with the pattern. I highly recommend anything by Aden & Anais. My kids use them from birth to forever. I sew and have tried buying muslin fabric, nothing compares, these truly are unique and a wonderful gift to give. I love how lightweight and the feel of 100% cotton on my child. THey are nice and stretchy and a great print. FYI the blue is more of a turquoise than a baby blue but still very cute. I bought this set as a gift but have the baby girl version. You will have to wash a couple of times before use because they do have a very strong color dye odor. These blankets worked great to swaddle our baby during the higher temperature months of the year. We normally use flannel, but with hotter temperatures, it was too much. I am about to have my 5th baby. I only found out about Aden & Anais blankets with my 4th. This is one item I tell other moms is a must have. There are a lot of baby items that seem like a great idea, but only become a waste of space, this is not the case with these blankets. I love them. They are so soft, large, breathable and perfect for swaddling baby. This item is up there with diapers! It's a must have.